Kalynn:Welcome back to Act Local Marketing for Small Business, Laurie. The next trend I’d like to discuss is mobile and mobile management and mobile app usage in the SMB market. Laurie:Well, what we’ve seen with mobile is really fascinating. I’ve never seen adoption in a technology area occur at such a fast and furious pace. It’s been just unbelievable since the iPhone was launched. The iPhone changed everything because it personalized the devices, and spawned this whole app ecosystem, and it just made these phones that we all now carry around become critical in our personal lives and in our businesses. As a matter of fact, 67% of SMBs now view mobile solutions and services as critical to their businesses. That’s kind of unbelievable considering just a few years ago you probably had a dumb phone and you might have relied on it but nothing like we rely on our phones now. 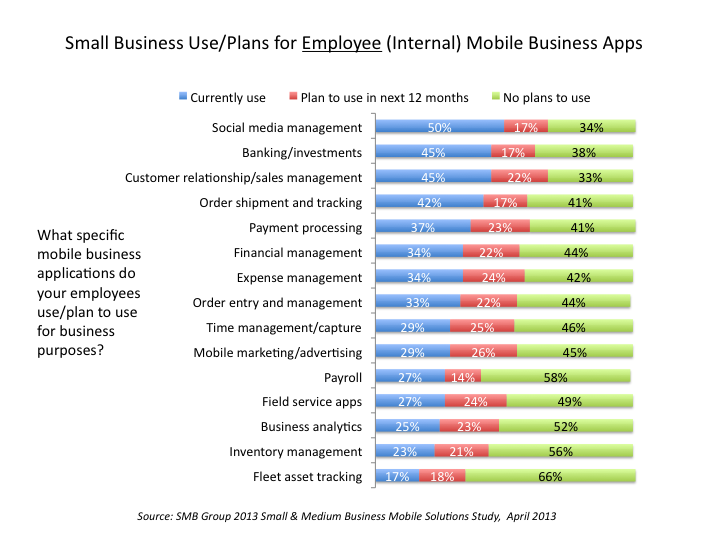 Kalynn: So what kind of mobile apps are SMBs using? Laurie: Basic collaboration apps—calendars, emails, messaging and contacts—are already mainstream. About 83% of SMBs use them. SMBs are also adopting mobile apps for very business-specific functions. So, for things like order entry or inventory lookup, or to log time and attendance or enter payroll. Mobile is becoming part and parcel of how we conduct business. Almost half of SMBs also either have or are planning to build a mobile-friendly website to engage customers using mobile devices. Sometimes you don’t even have to build it. If you have a WordPress site it’s automatically mobile friendly. Kalynn: Right, many themes now are mobile-enabled, and adjust depending on the size of the screen. Laurie: If you’re not doing this, you need to. It’s so frustrating to go to a site and have to keep adjusting the screen to read the text because it’s not mobile-friendly. Some SMBs are also starting to deploy specific mobile apps to engage with their customers and prospects for appointment scheduling and payments, and things like that. Kalynn: Do they develop their own proprietary mobile apps? Laurie:Not necessarily. For instance, restaurants may use something like OpenTable. My hair salon uses a mobile app that lets me book and confirm and all that kind of stuff on my mobile device. Some SMBs are also developing their own mobile apps or paying third parties to develop tailored apps for them. Most of the backend applications that SMBs use have mobile app extensions, which are often available on Apple and Android app stores. If the right mobile app is available and can snap into your existing app, that can do the trick. Kalynn: There’s absolutely no need to do customized right off the bat because so many apps are already out there that you can be a part of. Don’t forget that in terms of making sure you’re getting found online, because I’m always thinking in terms of SEO or Search Engine Optimization, a lot of these review sites like Yelp have mobile apps. People will go on them to check reviews about your business, more often than not from a mobile device. I’m not sure I remember the exact statistic but it was something 68% of people have their mobile phone within arm’s reach at all times. Laurie:It may be even higher. Also I think we’ve already passed the point where more searches are done on a mobile device than on a laptop or traditional PC or MAC. So this makes mobile management critical because it’s a given that our reliance and use of mobile apps will continue to rise. 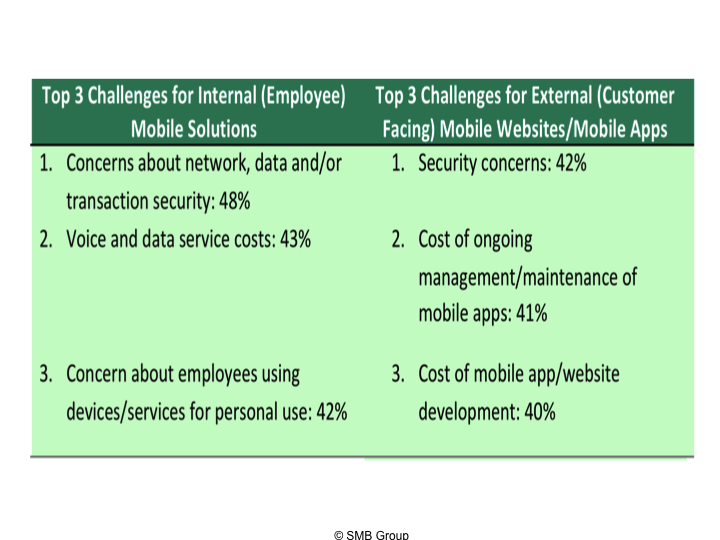 SMBs must keep pace with the mobile explosion. You need to be able to manage not only the mobile devices in your company but also internal applications that your employees are using. With any mobile applications, security, management and provisioning are very important. If you’re not yet doing anything, in this area, the time has certainly come. Kalynn: Right, you have to because employees are using so many devices and apps. 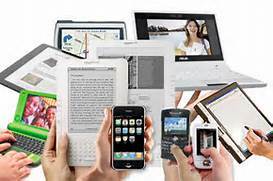 Bring Your Own Device (BYOD) means that companies are less apt to supply people with devices. Everyone has a favorite and they have to all work together. You really have to think about mobile policies and procedures for mobile devices and various apps. Laurie:Yes, fortunately there are a lot of vendors that have mobile management solutions now geared towards SMBs from vendors like AirWatch or MobileIron. And from vendors that you might already be doing business with like Dell or HP or IBM. A lot of them are cloud-based, so that makes them easier to deploy and use. Kalynn: Right, and I’m sure there are tons of consultants that work with these solutions and can help you figure it out too. In the third of this four-part series, I’ll recap Kalynn’s and my conversation about “SMBs View Payment Systems in a New Light.” You can listen to the complete podcast here.